Adam Scheinman took office as President Barack Obama’s special representative for nuclear nonproliferation on September 22, 2014. Over the past 15 years, he has held nonproliferation positions in the Department of State, the White House, and the Department of Energy. Scheinman spoke with Arms Control Today in his office on March 6. The conversation focused on preparations for the 2015 Nuclear Nonproliferation Treaty (NPT) Review Conference, which begins on April 27 in New York. Scheinman discussed the outlook for the conference and provided some details on the U.S. view of the measures needed to preserve and strengthen the treaty. ACT: Thank you for doing this. It’s the day after the 45th anniversary of the NPT’s entry into force, and very appropriately, we’re speaking to you about the upcoming review conference. Just to set a little historical context, in the run-up to the 2010 review conference, there were a number of positive events, such as the negotiation of the New Strategic Arms Reduction Treaty [New START], the UN Security Council summit-level meeting on disarmament, and President Obama’s Prague address on a world free of nuclear weapons, that provided some momentum going into the conference. The conference then produced a detailed consensus action plan to strengthen the treaty. Now, in the run-up to the 2015 review conference, you have been in touch with officials from many of the countries that will be there. How would you characterize the atmosphere among the parties as a whole or in various groups in the run-up to this conference? Scheinman: I would say that the attitude of most governments is one that’s very supportive of the NPT. It’s clear that support for the treaty is deeply rooted in the international community and among governments, as well as among regional groups. The approach that governments are taking has been serious and constructive. There are clearly many differences among the parties on some of the key issues within the treaty, including nuclear disarmament and some of the regional concerns, but I think we can expect differences in a global treaty of this sort and especially one that includes states with nuclear weapons and those without nuclear weapons. ACT: And overall, do you think the NPT is in good health? Scheinman: I think the treaty is in good health. There are certainly tensions within the treaty, but the treaty has lived with these tensions for its full 45 years. It has endured review conferences that have produced agreements and final documents as well as those that haven’t. We’ll certainly work toward an agreement in 2015. That’s the approach we’ll bring to the review conference, and I think others will too. We’ll just have to see how it plays out in New York. ACT: We’re going to come back to some of the points you raised, but just generally, is there clarity about what states can strengthen and implement in the NPT’s provisions and how they can do that? Do you have specific goals to strengthen the treaty at this point? Scheinman: Well, yes. We would like to encourage countries to pursue a pathway to nuclear disarmament that is sustainable. All countries wish to see that. There are differences, though, on how fast we can get there and what conditions have to be in place in order to achieve it. Those differences will have to be addressed at the review conference as we work through the debate and toward a final document. We do have in mind a number of steps that preserve but also enhance the action plan that was agreed in 2010, and we’re prepared to deal with all of those issues at the review conference. ACT: You mentioned coming to an agreement and the final document. As you know, a common measure of the success of the NPT review conferences is whether the parties are able to reach agreement on a final document. Do you think that’s likely this time around, and what, in the view of the United States, would make the conference a “success”? Scheinman: Well, I wouldn’t want to give odds on whether we’ll have a successful review conference. We do have in place a review conference president, Ambassador Taous Feroukhi from Algeria, who is very active. She’s putting together her team, chairs of the various committees, and possibly subsidiary groups if we have them, and she has consulted widely. That’s an important first step. The question of whether we can achieve a consensus—as I said, we will certainly work toward a consensus final document—will require that countries not pursue extreme agendas or place unrealistic demands on the treaty. If countries come to the conference prepared to pursue compromise and agreement, I believe we will get a final document. If countries are unwilling to bend on positions that are stridently held, then certainly the prospects are dim. ACT: Do you have a sense—are you expecting people to come in with strident, inflexible positions? Is that the body language that people are showing in your discussions with them? What is your expectation? Scheinman: I think it’s a little too soon to know whether this conference will or won’t produce a final document. This will be a negotiation. All review conferences, in essence, are a negotiation of the final document. We’ll have a better sense once we’re into the proceedings as to whether a compromise can emerge. At this stage, our approach is to clarify our positions on various NPT issues, both challenges and possible remedies. Other countries and groups are in a similar place. As I noted, our preference would be to achieve a consensus document, but that is not the only measure of success or of broad support for the treaty. ACT: What are the messages that the United States is bringing to the review conference on the three pillars of the NPT? Scheinman: We seek to advance implementation across all three pillars of the treaty. These are mutually reinforcing objectives; we don’t see one as more or less important than the other. We don’t accept the argument that progress in one area is an absolute condition for progress in another. These are objectives that should go forward together—nuclear disarmament, nonproliferation of nuclear weapons, and peaceful use of nuclear energy. That is the approach we take. We’ll consider all good ideas that advance each of those pillars and build on the action plan that was agreed in 2010. It’s worth noting that the action plan that was adopted in 2010 was unprecedented in the NPT review process. We don’t seek to dispense with it five years after it was agreed; we’d like to ensure that it is preserved and that states give serious thought to ways to carry its implementation into the future. This was never intended to be a five-year checklist or that we would start fresh in 2015. We will continue to advance it where there is agreement to do so. ACT: Are there specific measures or additional actions that you are seeking support for from the other nuclear-weapon states and from the non-nuclear-weapon states? In the context of the action plan, you had mentioned some things you were planning to do to preserve and enhance the action plan. If you could be a little more specific. Scheinman: Well, yes. On nuclear disarmament, the president has said we are prepared to go farther in reducing nuclear weapons through negotiations with Russia on another one-third reduction in deployed strategic nuclear weapons. That offer remains on the table, and NPT parties could acknowledge it as a possible next step. The president has also said that we would like to see the now 70-year record of non-use of nuclear weapons be extended forever. We think that’s a reasonable principle for NPT parties to endorse in 2015. The CTBT [Comprehensive Test Ban Treaty] is not in force globally; we think it should continue to have encouragement given its long tie to the NPT’s disarmament goals. Fissile material cutoff treaty [FMCT] negotiations have not seen the light of day; we would like to see the NPT membership give that renewed encouragement. With respect to nonproliferation, we’d like to ensure that the additional protocol is seen as a global priority and, together with comprehensive safeguards agreements, as a standard for verifying Article III of the NPT, the safeguards requirement. We also think that more than 10 years now after North Korea announced its withdrawal from the NPT, it’s time for NPT parties to agree on steps that could be taken to prevent abuse of the withdrawal provision of the treaty. We’d like to see the peaceful uses pillar receive the attention it deserves. Too often, it’s a forgotten third leg of the stool. We think that’s a mistake because the majority of states-parties benefit directly from peaceful uses and technical assistance. The peaceful uses initiative was announced in 2010. We’d like to see it continue for another five years; it’s been a very successful tool for expanding peaceful uses in the developing world. There are recent actions that have been taken on nuclear safety and security since 2010 that could be reflected in a final document. So, there’s plenty for NPT states-parties to focus on in terms of new work. ACT: That’s a good outline of many of the issues that will be discussed, so let’s come back to some of these to go into a little more depth. Over the past several months, a number of serious observers have been warning about the risks for this review conference and for the NPT if there is not faster progress on the Article VI disarmament commitments. A few days ago, UN High Representative for Disarmament Affairs Angela Kane noted, “[T]he vast majority of non-nuclear weapon States do not view the Action Plan as an open-ended goal.” You said you don’t see it as a series of steps that have to be accomplished in five years, but many other states also come back and say it’s also not an open-ended goal. Kane argued that it’s “incumbent upon the nuclear-weapon States to outline how they propose to reach the final destination” of a world free of nuclear weapons “in the shortest possible time.” So you mentioned that President Obama’s offer for a further one-third reduction in U.S.-Russian strategic arsenals below New START levels is still on the table. Is there any degree of support from the Russian side at this point? Are there any common steps that the United States and Russia might be prepared to commit to in the future with respect to their 2010 action plan commitment to pursue and accelerate steps on nuclear disarmament? Scheinman: I think there are a couple of points there. One is, “Can one put a time limit, or a schedule, to the elimination of nuclear weapons?” and the answer is “no.” The answer is no because, number one, the conditions to get to zero are extremely demanding; it’s not just a matter of political will of the states that have nuclear weapons. Security conditions have to be in place, and no one can predict with any precision, for example, when Russia will come to the table on negotiations, nor can we predict when the regional conflicts that have given rise to proliferation in other parts of the world will be resolved. It’s just not a reasonable prospect, and that is why the president said that nuclear disarmament is the goal but it’s going to take time, it’s going to take persistence, and we have to pursue it along a trajectory of concrete, achievable steps. We can’t leapfrog to the last step before other steps are in place. That’s just not a practical alternative. In terms of specifics on U.S. and Russian reductions, I can tell you that our offer remains on the table and that we have said we’re prepared to work with Russia on the full range of strategic stability issues, addressing all of the various concerns that Russia has raised. We hope that Russia will accept the offer. Even better if they accept the offer before the review conference, but I don’t know if they will. ACT: You mentioned the FMCT and the United States’ disappointment that the negotiations have not begun. That’s of course due in part to the fact that the Conference on Disarmament [CD] has not been able to agree to a work plan for quite some time. Given that situation, is the United States considering or are other states considering exploring new venues for those discussions or negotiations on an FMCT or other ways to move forward? In other words, might we expect some new ideas on how to unblock the FMCT negotiations in the next few weeks at the NPT review conference? Scheinman: Well, some progress has been made on an FMCT through a UN group of governmental experts, which is holding its final meeting this month and will make its report later this year. We think there have been very good discussions on aspects of an FMCT in that group, and we hope this work continues. That’s a small step, but a useful step nonetheless. We have made clear our disappointment with the holdup on FMCT negotiations and noted our readiness to support FMCT negotiations that involve the key states. The reality is that all of the key states sit in the Conference on Disarmament, so it’s difficult to conceive of another venue that would not be affected by the same problems that have been preventing FMCT negotiations from starting in the CD. So, it’s not clear that there is a feasible alternative venue that would work. We continue to believe that it would be far better for states to deal with their problems with a treaty in the context of negotiations and not hold up negotiations. ACT: When you say “key states,” do you mean the nine states that have nuclear weapons programs, or would that also include states that have fuel cycle programs but are not weapon states? Scheinman: I’m referring minimally to states that have nuclear weapons. ACT: You said that disarmament can’t have a specific timeline and you and others have talked about the step-by-step approach, so can you say what the steps are that are involved in that approach? And do the other nuclear-weapon states agree about those steps? We’re referring specifically to the recent statement at the P5 conference that was issued in February about the step-by-step approach. Scheinman: I think all five NPT nuclear-weapon states support the principle of a step-by-step approach to nuclear disarmament. The precise sequencing may reveal some differences, but in general terms, I think we all view it in a similar way, in that there is still work to be done in terms of reductions by the United States and Russia, since these two states hold 90 percent of nuclear weapons in the world. That is why the president has called for a further bilateral reduction, in negotiations with Russia. Following that round of cuts, perhaps at that point we’re at a level where discussions among all five NPT nuclear-weapon states may make sense. But for the time being, we’re at levels that are still too high to consider a P5 negotiation. That’s not a credible next step for today, but is a step down the road. In terms of multilateral actions, there’s clear agreement on pursuing CTBT entry into force and an FMCT as measures to limit stockpiles in the nuclear arms-possessing states. I would just stop on FMCT to say that often it’s overlooked and seen as an agreement that perhaps would have been valuable 20, 30 years ago. Of course, it’s been on the NPT agenda for the entire life of the NPT. I think it’s a mistake to view it as a throwaway of sorts because it’s inconceivable to my mind that the five nuclear-weapon states would support an arms control negotiation among the five in the absence of a legal cap, a verified cap on fissile material production. And of course, it’s a measure to bring in states outside of the NPT. So, it’s absolutely essential as a next step but unfortunately overlooked. We’ve also pursued signature and ratification of the protocols to nuclear-weapon-free zones. This is something the administration sought actively since the Prague speech. It’s a means of providing a legal negative security assurance to non-nuclear-weapon states. Non-nuclear-weapon states have said they have a legitimate interest in obtaining such assurances, and we agree that states that abide by their NPT commitments ought to have that assurance. We signed the Central Asian Nuclear-Weapon-Free Zone [Treaty] protocol in May, and we’re working actively to be in a position to sign the Southeast Asia zone protocol soon. ACT: What is the holdup on that? That seemed on the verge of completion for a while. Scheinman: We negotiated a revised protocol in 2011 and were preparing to sign it at the ASEAN [Association of Southeast Asian Nations] meeting in the summer of 2012 when it became known that some of the P5 states make statements at signing, or in the case of the United States, we make statements at ratification. These are national statements to clarify positions on a treaty or protocol provision. Some could be considered reservations; some are simply interpretive statements that don’t meet the threshold of a reservation. This is standard P5 practice for the zones; every zone treaty protocol the P5 states have signed has been accompanied by such statements. They’re not out of the ordinary, but they surprised the ASEAN states. It’s been very slow work trying to engage and resolve these concerns with the ASEAN states, but we’ve continued to work at it. I was just in Southeast Asia earlier this week to keep the dialogue moving. We are making progress and hope to be in a position to sign at some point soon. ACT: On the steps the United States needs to take to approve the protocol to the other nuclear-weapon-free zones in Central Asia, a nuclear-weapon-free zone in the South Pacific, Africa, could you just update us briefly on the status of preparations to bring those to the Senate for consideration for advice and consent? Scheinman: The two that you mentioned, for Africa and the South Pacific, were sent from the White House to the Senate Foreign Relations Committee in 2011, so they’re on the treaty priority list. As for the Central Asia zone, we intend to also submit the package [of documents] to the Senate soon. Of course, if we’re able to sign the Southeast Asia protocol before the review conference, which I don’t currently expect, we’ll try to get that package sent to the Senate as soon as possible. We hope to be in a position to brief staff and members of the new Senate Foreign Relations Committee soon. ACT: You mentioned the CTBT a couple of times. It’s also a treaty before the Senate for consideration for advice and consent. It’s also been one of the treaties that has been part of the NPT’s history since 1968, 1970. What can you tell us about what the United States, Russia, China, and the other nuclear-armed NPT member states are doing to reinforce the CTBT, to advance entry into force, pending action by the United States, by China, and the other Annex II countries? What might we expect the P5 states to commit to, to encourage at the NPT review conference in this regard? Scheinman: Well, I think all P5 states are firmly supportive of the CTBT, even if all five have not brought it into force. In every P5 statement to the NPT and in the six P5 conferences we’ve held to date, support for the CTBT is clear; that’s point number one. Number two, we have increased our technical work on CTBT verification-related issues, including in Vienna. 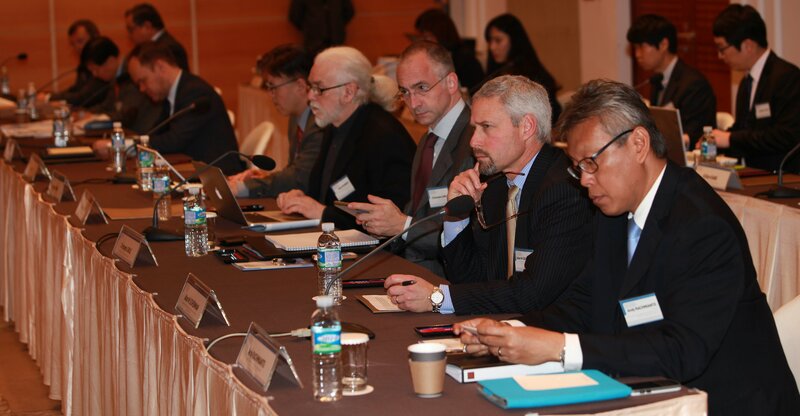 P5 experts have been meeting on CTBT-related topics, and we’d like to see that pace of activity pick up. And three, we each have our own domestic responsibility to pursue ratification. In our case, the president of course is clearly committed to supporting the CTBT, but we will not take the treaty to the Senate unless we know we have support from a sufficient number of members. At this stage, Undersecretary of State for Arms Control and International Security Rose Gottemoeller has been very busy traveling around the country and building the case for U.S. support for CTBT. It’s a treaty that would advance our national security interests and advance global security. ACT: You talked about the steps everyone supports, but you said there might be some differences among the P5 on sequencing, so can you give us an illustrative example? What’s the kind of difference that exists? Scheinman: Well, the simple example is the United States is prepared and has been prepared to pursue further nuclear reductions with Russia. Russia is not prepared to pursue such reductions today. ACT: On the P5 process, the five nuclear-weapon states have had six meetings since 2009. What are the results of this P5 process? Scheinman: Well, in summary, the process has been very constructive in our view, not in terms of short-term or immediate deliverables necessarily, but in terms of the long-term investments we’re making in a process that supports arms control actions that the five could take together. To this stage, the process has encouraged dialogue on nuclear transparency, verification, and strategic issues. We’ve used the process to brief the United Kingdom, France, and China—the three states that have yet to be involved in nuclear arms control reductions—on New START verification. We’ve briefed each other on various aspects of our nuclear posture, so it’s a dialogue that’s beginning to take form. In terms of tangible outcomes, the process has encouraged greater transparency among the five, including through agreement on a standard reporting framework, which we each used to report to the NPT Preparatory Committee meeting in 2014. We each expect to update our reports at the 2015 review conference. We will also complete a first edition of a glossary of nuclear terms that will be distributed at the 2015 review conference. This, to many, sounds insignificant. But to our thinking, this is needed to lay the groundwork for eventual P5 talks on nuclear arms control. We hope that subsequent editions of the glossary will look at terms or concepts that are more specific to arms control. ACT: Will this process continue? Scheinman: Yes. The P5 statement following the London conference made note that France is prepared to host the seventh conference. We don’t have a date quite yet, but clearly after the review conference. ACT: But continuing into the foreseeable future? ACT: What are the next steps? What’s on the agenda for the upcoming five years or perhaps even beyond that? Scheinman: Well, as an immediate step, we would like to see further work done on a nuclear glossary. We would like to see additional technical work on arms control verification; this could mirror the International Partnership for Nuclear Disarmament Verification that Undersecretary Gottemoeller announced a couple of months ago. That partnership will involve nuclear- and non-nuclear-weapon states. Similarly, the five could pursue transparency actions with nonweapon states. We plan to host a group of officials from nonweapon states at the Los Alamos and Sandia national laboratories at the end of March. And of course, as the P5 group, we plan to use these conferences as a venue to consult and coordinate on key NPT issues, including dealing with some of the regional challenges and priorities for strengthening the NPT. ACT: To talk about some specific issues and areas, the talks on Iran’s nuclear program are ongoing and presumably will be part of the backdrop for the review conference. What impact might they ultimately have, through either success or failure, on the NPT regime? Scheinman: Well, there are two levels of impact. One is on the review conference itself, and the second, more generally, is on the NPT. In terms of the review conference, it seems fairly straightforward. If there’s a framework deal in hand by late March, with details to be negotiated subsequently by June, then we can expect that the impact on the review conference would be positive. If the talks collapse and we’re into another cycle of escalating tensions, then the impact will be quite negative. I think it would be very difficult to imagine a review conference ending in a consensus final document if the P5+1 talks with Iran collapse in late March. I certainly can’t get into any details on the discussions with Iran. We’re hopeful the negotiations will produce a successful outcome. In terms of impacts on the nonproliferation regime, we’re of course very concerned about Iran pursuing nuclear weapons because of the potential for much greater proliferation and instability in the Middle East. Should the talks collapse and Iran restart its nuclear program without constraint, then I think the impacts on the nonproliferation regime would be very, very negative over the next two, five, 10 years. ACT: One aspect of the agreement that the P5+1 and Iran are trying to reach has to do with enhanced monitoring and verification. In November 2013 in the interim agreement, they specifically identified the additional protocol as one of the things that should be a part of any comprehensive agreement related to Iran’s program. Given how long the NPT states-parties have been discussing enhanced monitoring and verification, how would—if there is a P5+1 agreement with Iran, how do you think that might positively reverberate with the effort to universalize the additional protocol and enhance the IAEA’s [International Atomic Energy Agency’s] authority? Scheinman: Well, again I can’t discuss aspects of the negotiation. As a general point, an agreement with Iran that includes strict verification measures will naturally have a positive influence on nonproliferation efforts. Support for the additional protocol is not dependent on Iran; that support exists now. We’re up to 124 states now with an additional protocol in force, and the number of states without one that have any significant nuclear activities is increasingly small. I don’t know that a positive resolution of the Iran issue will lead all of the states that have yet to accept the additional protocol to proceed with one. Several of those states reject an additional protocol for political or regional reasons unrelated to Iran or the example set by others. ACT: You mentioned the additional protocol. In Iran’s case, there would almost certainly be some measures beyond that. Is there a possibility that that would set a standard for nonweapon states with fuel cycle programs or specific ways of monitoring centrifuge programs or something like that? Scheinman: No. I think this is a negotiation and an approach that’s specific to Iran. We haven’t taken the position that whatever comes out of the talks should be the new standard for nonproliferation or safeguards. ACT: One of the key commitments of the 2010 NPT Review Conference was to hold a conference in 2012 on ridding the Middle East of nuclear and other nonconventional weapons, but the conference has not taken place. What are the obstacles at this point? Scheinman: The principal obstacle, at this point, is the difference of view on an agenda for the conference. But I think it’s worthwhile to take a half step back because, since 2010, we have exerted huge diplomatic efforts to bring the regional states together to reach agreement on terms for this conference. We’ve had five regional meetings involving Arab states and Israel. Israel has attended each session and at a high level. Iran has attended one of these sessions. We hope to have a sixth meeting before the review conference or soon after. The regional consultations have been constructive. Each side has a better appreciation for the views and concerns of the other. There is still a substantive gap, but in terms of how far we’ve come to advance the process and to zero in on differences on an agenda, we’re actually not that far off. But to reach agreement will require that both sides come to the next consultation prepared to draft an agenda that allows each to discuss issues deemed important to the achievement of a zone. ACT: What are the United States and the other conveners and other involved states doing to broker that compromise? Are you encouraging meetings? Are you presenting your own versions of proposals that would address the countries’ concerns? Scheinman: We discuss the full set of issues that might be addressed at a conference through the regional consultations and any other diplomatic opportunity we have, whether that’s individually or as a collective group of conveners. The pathway to a conference is agreement of the regional states. They have to bear the responsibility to carry negotiations forward, to seek compromises, and to speak to each other directly. They can’t negotiate through facilitators and conveners. This process will only work if the regional states are engaging directly and take responsibility for reaching an agreement. That’s what we encourage. ACT: With or without the conference, what agreements, treaties, or initiatives would the United States like to see the states in the region pursue to reduce nuclear-related risks? Scheinman: Our focus at this stage is on reaching an agreement to hold a conference. The conference itself can start a process that might consider additional actions that states in the region would be prepared to take. It could span across the full range of weapons of mass destruction- or military-related issues. But the first step is the most important step because without it, there’s no prospect for advancing arms control in the region. We think this process can have real value because there has been no forum to discuss regional security issues involving states in the Middle East for almost 20 years since the Arms Control and Regional Security process collapsed in the mid-1990s. ACT: Shifting to another region, you talked earlier about North Korea and the [NPT] Article X issue. In 2003, North Korea announced its withdrawal from the NPT, applying the provisions of Article X in a way that some countries found questionable. The five nuclear-weapon states, in a statement at their conference in London in February, “expressed the hope” that the review conference would reach agreement on language concerning the “potential abuse of the exercise of the right of withdrawal” under Article X. What is your current assessment of the prospects for such an agreement? Scheinman: I’m hopeful that if we have a consensus document, it will include recommendations on the issue of withdrawal. There has been, I would say, an emerging view that this is an appropriate issue for NPT parties to address and to take a common position on. There have been working papers in the NPT process by a variety of different groups, including the Non-Proliferation and Disarmament Initiative—which includes states that are in the Non-Aligned Movement, as well as those with a more Western orientation—and we see common themes emerging throughout all of these initiatives. The P5 holds a shared view of how NPT states-parties might deal with this issue, and so from a political standpoint, I think the time is right to seek consensus on arrangements that all NPT states-parties can support. ACT: In the view of the United States, what would such an agreement need to cover? What would it need to include to be meaningful and supportive of the NPT? Scheinman: As a matter of principle and international law, NPT states-parties should acknowledge that any state that violates the treaty and then withdraws from it should remain accountable for those violations. There’s no get-out-of-jail-free card with respect to the Article X withdrawal provision. We don’t intend to rewrite, amend, or in any way revise the right of states to withdraw from the treaty. It’s a question of what are the appropriate consequences for a state that abuses its withdrawal right, either because, in the case of North Korea, it violated the treaty and then announced that it was departing, or it leaves the treaty and then uses peaceful nuclear supplies to pursue a military program. There are steps that can be taken, whether that involves consultations among NPT states-parties, action by the UN Security Council, verification activities that can be called for by the IAEA Board of Governors, and actions that nuclear suppliers can take to require permanent safeguards or cut off supply for states abusing the withdrawal right. ACT: Before we go to your final thoughts on issues we didn’t cover, I’d like to ask a broader question about the treaty. This is the 45th anniversary of the entry into force. This year marks the 70th anniversary of the first use of nuclear weapons. It’s often said that the NPT has, over the decades, reduced the risk of nuclear weapons, but many of the things we’ve discussed today are discussed every five years. Progress in terms of addressing these issues has been slow and difficult. Looking at this more broadly, do you think that the mechanisms that currently exist to help adapt and evolve the treaty to meet new challenges are adequate? Can it keep up with the times? Are there some adjustments to the mechanisms by which the states-parties look at the core provisions and look at ways of adjusting other than the current review process? Does that have to be considered in order for the NPT to survive another 45 years? Scheinman: I would say that, number one, there’s a tendency to define the NPT by a few failures or serious knocks on the regime experienced over the years. I think that’s a mistake. We should instead try to define the treaty by its successes, which are far more impressive than its failures, which are serious and of course have to be addressed for the long-term health of the treaty. But by and large, countries meet their obligations, and the security benefits, the developmental benefits, the peaceful use benefits that accrue to states are many. Most countries understand this; they embrace it, they accept it, and that’s why I think support for the treaty is deeply rooted in the international system. It is certainly possible to imagine a better NPT, but for me, it would be an American perspective of a better NPT, and it probably wouldn’t square with the perspective of other countries. If we sought to replace the NPT and start a new negotiation, it would never close because of the disagreements on nuclear disarmament and perhaps on approaches to countries that are not in the NPT. The NPT is the best we have; we’ve made good of it, and hopefully we can continue making better of it. The mechanisms to strengthen the treaty are available, and they are in place. Some are treaty based, some are international organization based, and some are coalition based, like the Proliferation Security Initiative and other initiatives that have emerged over the last 10 years. The question is how we make best use of the mechanisms available. The additional protocol doesn’t need to be revised; it needs to be adhered to. Safeguards should be adhered to globally. The UN Security Council is available to deal with threats to international peace and security. The Security Council should act when cases come to it. 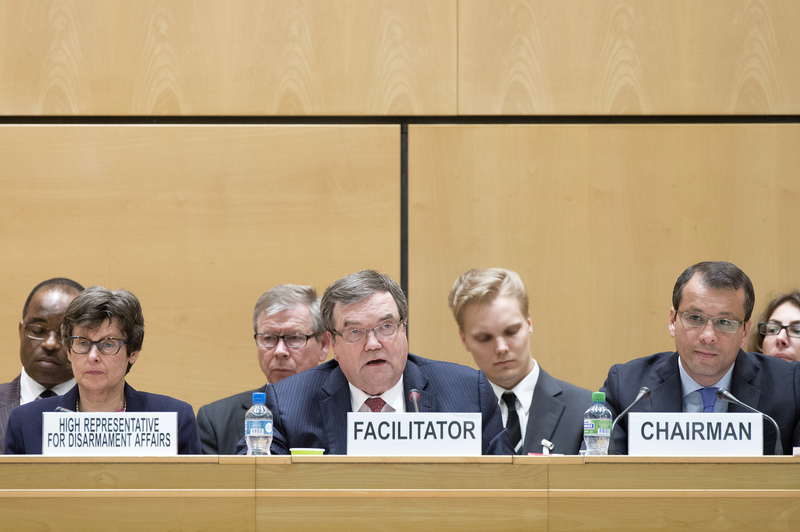 The Conference on Disarmament is available for states to negotiate disarmament measures. Countries should take advantage of that resource as well. Regional treaties exist; they should be fully implemented. So, I think the mechanisms are in place. But we live in the real world, where politics and the security interests of countries intrude on implementation of global instruments, and as a result, we do our best with what we have. I think we’re doing pretty well. 1. For the 64-point action plan, see 2010 Review Conference of the Parties to the Treaty on the Non-Proliferation of Nuclear Weapons, “Final Document, Volume I, Part I,” NPT/Conf.2010/50 (Vol. I), 2010, pp. 19-29. 2. Angela Kane, “NATO and the Future of Disarmament” (keynote address, NATO weapons of mass destruction conference, Doha, Qatar, March 2, 2015), p. 4, https://unodaweb.s3.amazonaws.com/wpcontent/uploads/2015/02/nato-qatar-2014.pdf. 4. Annex 2 to the Comprehensive Test Ban Treaty specifies 44 countries whose ratification is required to bring the treaty into force. Eight of those countries have not ratified the treaty: China, Egypt, India, Iran, Israel, North Korea, Pakistan, and the United States. 5. The Comprehensive Test Ban Treaty Organization is headquartered in Vienna. 6. Rose Gottemoeller, “The Vision of Prague Endures,” (speech, Prague, December 4, 2014), http://www.state.gov/t/us/2014/234675.htm; Bureau of Arms Control, Verification and Compliance, U.S. Department of State, “An International Partnership for Nuclear Disarmament Verification,” December 4, 2014, http://www.state.gov/t/avc/rls/234680.htm. 7. The six-country group negotiating with Iran over Tehran’s nuclear program is known as the P5+1 because its members are China, France, Germany, Russia, the United Kingdom, and the United States. 8. Under the terms of the final document of the 2010 NPT Review Conference, the conveners of the conference are the UK, Russia, the United States, and the UN secretary-general.